Highly appreciated in the market for its rich attributes such as distinctive appearance, robust designs, lightweight and perfect finish, the offered Stone Oil Burner is manufactured by using ultra-modern tools and equipment. To ensure a flawless range, these burners are rigorously checked by our team of quality controllers. Soft stone carved aroma burner. We offer a wide range of incense accessories. Oil Burners Used in Aroma therapy such as Releaxation. Our firm has earned reputation by offering top quality array Stone Oil Burner to our esteemed patrons. Handmade home decorative scented oil burner with different designs and colours with very fine finish. We can manufacture any shape or design in any colour and in any size. We are instrumental in offering supreme quality Stone Oil Burner to our esteemed customers. The offered stone oil burners are rigorously checked by our team of quality controllers to ensure a flawless range. Our exquisitely crafted Stone Oil Burner is widely used to spread pure as well as magical aroma in the home. The essence of the burning oils and herbs harmonizes and complement the ambience of the place and enhances the mood of people around. These Stone Oil Burner are an ideal gifts for your friend and family. We are offering our client an excellent quality range of Aroma Diffuser. 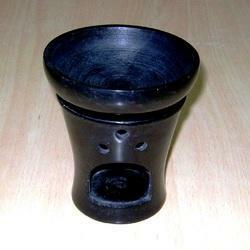 These Soapstone Aroma Diffuser are manufactured from qualitative range of raw material. These Aroma Lamp are offered in variety of designs, shapes, sizes and colours. Our assortment of Diffuser are available at most competitive price. Justifying our reputation in this market, we are readily immersed in the arena of offering to our patrons a broad consignment of Stone Oil Burner. 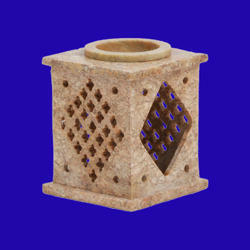 Owing to the rich industrial experience and expertise in this business, we are involved in providing Stone Oil Burner. Soap stone Oil Burners, available in a wide variety of shapes, designs and colors. Can alse be made by your specifications. Kindly write us if you need to see more products. We are counted amongst the renowned Manufacturers and Suppliers of Stone Oil Burners. Our Stone Oil Burners are made by experienced artisans and are widely appericiated for their unique design patterns. They will bring a freshness to your room when used with fragnant oils. Morover, our Stone Oil Burmers are also available at reasonable prices to suit every pocket.